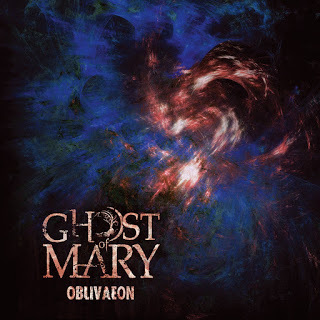 Ghost Of Mary is an Italy based melodic gothic/death metal band founded in 2015, although the first steps on the musical path date back to 2014. The six-man-outfit plays a surprising mix of gothic and death metal with distinct classical influences, presumably making their music quite complicated to write and create. Apparently however, this didn’t set the standards high enough yet, because they took it upon themselves to release a concept album, an allegory about life and death, as their debut, which, like composing within their musical style, is not exactly a walk in the park. Such high standards call for high expectations, so let’s see if they can live up to the self-set challenges. Oblivaeon, as this release is called, opens with an intro that summons a dreamy, somewhat melancholic atmosphere that maintains into the early stages of the next song called Shades. Vocalist Daniele Rini’s crooning joins the slow, sleepy song which bursts into flames only a while later, transforming the vocals from sweet into grunt in the blink of an eye only to once again transform, this time into a low screaming, just seconds later. This transforming of the vocal style turns out to be a repeating theme throughout the entire album, Daniele does not hesitate to change styles time and time again. He switches from deep grunts to clean screaming shouts to a hoarse roar to crooning in no particular order and vice versa. As impressive as that may seem, it does have its downside, there’s a reason multifunctional vocalists are rare. Even though Daniele is a great singer who definitely has the potential to become a multifunctional vocalist, there’s still some room for improvement. It’s in no way insurmountable, but here and there it is audible he does not control every aspect of his vocal range and the use of it fully. Yet. This, like I pointed out, is only a minor letdown, it does not take away anything of the overall quality and attractiveness of the album. It’s a very enjoyable musical journey with an abundance of quality in my opinion. Every now and then you run into a band that has the makings of a great band and that manages to impress right from its start. To me Ghost Of Mary is such a band. In fact, even though there’s room for tweaking here and there, in my opinion Ghost Of Mary is the one of the most promising bands I have heard in years. It may be a bit rough around the edges, unpolished if you will, as if they’re still searching for the right chemistry in both vocals and music, but that is something that time and experience will solve I’m sure. Oblivaeon has plenty of gems to be discovered along the way. The contrast between the heavy death metal riffage and the dreamy classical parts in Ghost Of Mary’s music is stunning at times, keeping things interesting throughout the album. Most noteworthy songs must be the mighty Shades and the jittery Nothing, but there really is not a bad song on this album. The guitar tandem Mauro Nicolì and Gabriele Muja form a perfect collaboration, jumping from massively heavy to adorably sweet and they still manage to squeeze in a few raging solos as well. The drum kit is occupied by Damiano Rielli, whose solid, strong and rhythmic drum work flawlessly tracks the rhythm set by both guitarists and singer Daniele. Together they provide the perfect frame for the classical instruments, played by Joele Micelli, to wander around in. Sadly both the classical parts and, be it less evident, the bass lines sometimes drown in the violently mixed vocals, guitars and drums. Joele and bass player Nicola Lezzi are great players, if not excellent, but their parts are definitely underexposed on Oblivaeon, which prevents them from shining. To me this seems to be a production issue and as such easily solvable. There is no doubt you will hear a lot more from The Ghost Of Mary in the near future. Provided they keep growing, improve the production and are able to find the right chemistry to lose the somewhat chaotic use of the various styles of both music and vocals they could have a great future ahead. Time is their ally, and, thanks to this release, so am I. This one is worth a special mention in my year list, you should definitely give it a thorough listening to.